Puzzle boxes and pinheaded demons will make a comeback, but it seems like everything else will be new. Patrick Lussier and Todd Farmer are the director and writer team behind the upcoming Nicholas Cage movie, Drive Angry. They're also the minds behind the slow moving Hellraiser reboot - which was announced way back in 2006 - and they've let slip a handful of details about what they're planning to do with the series. The original Hellraiser was the brainchild of British horror writer Clive Barker. The series revolves around the hedonistic Cenobites: a collection of otherworldly sadists led by the nigh-iconic Pinhead, who can be summoned by solving an ornate puzzle box. Since the release of the first movie in 1987, there have been seven sequels, the most recent of which, Hellraiser: Hellword, came out in 2005. The first three sequels saw theatrical releases, while the remaining four went straight to DVD. As is often the case with long running horror franchises, the later movies aren't all that great, getting further and further away from what made the series interesting in the first place. 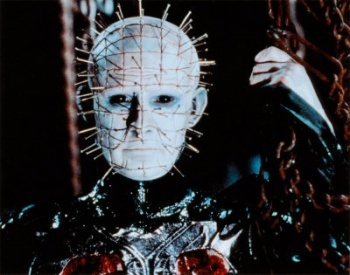 Lussier and Farmer have the unenviable task of breathing new life into the franchise, and it seems that "new" is the important word, as the pair made it very clear that they were not simply remaking the original Hellraiser film. They said that the first movie, which was written and directed by Barker and based on a novella that he wrote, was - funnily enough - very much Barker's story, and that it would hard for them to go back and re-tell it. Instead, the reboot would be set in the same world as the original movie, but would tell a new story. They also made it clear that they were making an R-Rated movie, and had actually had their contracts changed to reflect that fact. However, when asked about whether any familiar faces from previous installments of the franchise would make an appearance, the pair was rather more coy. When the names "Julia" and "Kirsty" - both characters from the original movie - came up, they just smiled at each other. There's a lot of potential in the Hellraiser franchise, but it's been a long time since it's really been at the top of its game. Hopefully, this new movie, which is scheduled for release in 2012, will reinvigorate the series and bring some fresh ideas to the table.